Say "pineapple rice with chicken" and most people will say, "Thai." They'd probably follow that up with "Delicious!" And they'd be correct on both counts. 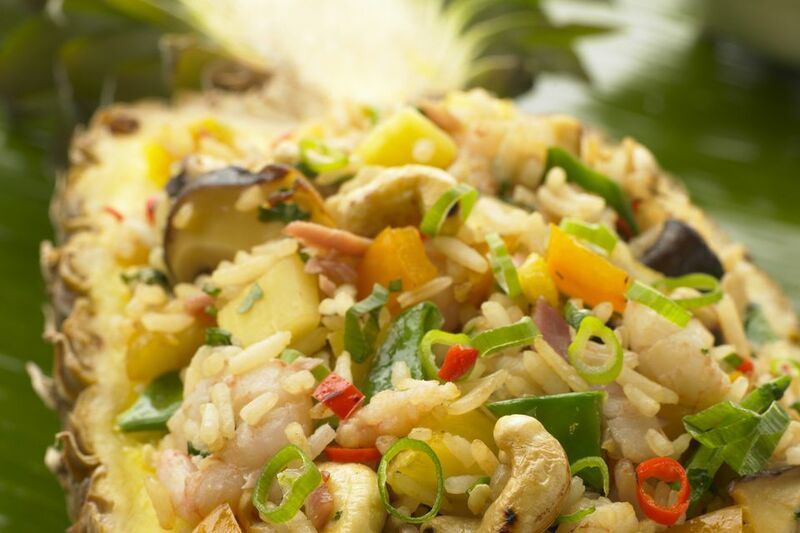 But, to be more accurate, pineapple rice, with chicken or seafood, is also a Cambodian dish. It just wouldn't be fair to let the Thais get all the credit. What is this pineapple rice dish exactly? It's fried rice, pure and simple. But, to the basic fried rice, chunks of fresh pineapple are added. The pineapple chunks are cut from the pineapple flesh that is scooped out of a halved pineapple. The juices that get squeezed out during the scooping process are not thrown out but, along with the diced pineapple flesh, added to the rice as well. Because there is chili in the dish, the sweet pineapple chunks and juice get mixed with the heat of the chilies creating a delicious balance. Which is best for pineapple fried rice: chicken or shrimp? Both are good. Neither one is "better" but your choice will affect the flavor of the cooked dish, naturally. There is even no need to limit the choice between chicken and shrimp. Go for squid or diced fish fillets! Catfish fillet is an especially inspired choice. So, treat the "400 grams shelled shrimps" in the ingredients list below as something that can be substituted with chicken, squid or fish. As a final note, this is a stir fried dish. Stir-frying requires extremely high heat during all stages of cooking. Place the pineapple on a cutting board. Holding it securely with one hand, cut it lengthwise into halves. Scoop out the flesh from both halves, leaving about an inch of flesh attached to the skin. Take the pineapple flesh and dice. Measure a cup; reserve the rest for another dish or for munching. Save any juices that drip off. Heat the cooking oil in a wok or frying pan. Add the shrimps. Sprinkle with salt and pepper. Stir fry just until the shrimps change color. Scoop out and transfer to a bowl. Set aside. Add the garlic, ginger, chili, shallots, tomatoes and bell peppers to the hot oil. Drizzle in about a tablespoonful of fish sauce and stir fry for half a minute. Add the ham and continue stir frying for another half a minute. Add the rice to the vegetables and ham. Drizzle in more fish sauce and the pineapple juice. Stir fry for a minute. Finally, add the pineapple chunks, shrimps and cashew nuts. Continue stir frying for another minute. Taste the rice, adjust the seasonings, if needed. Ladle the rice into the hollowed pineapple halves. Sprinkle with scallions. Serve at once.